Forgetting your friend’s and family’s birthdays or other special events just comes with the territory. Let’s face it, sometimes you have a lot going on in your own life and these things can slip your mind. 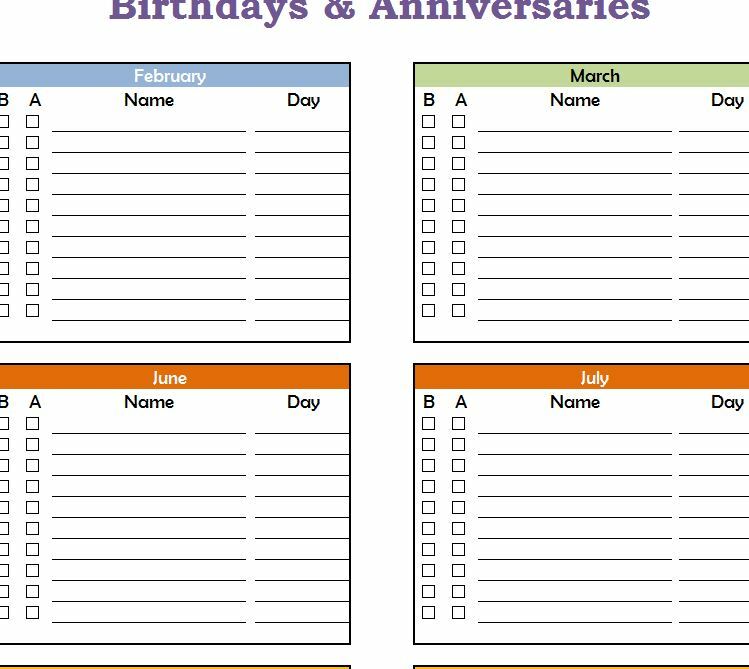 The Birthdays and Anniversaries Calendar will organize all that information for you in calendar sheet. Each month of the year will be listed on one page, with its own table. You’ll just go in and fill out all the important dates for that month. No more forgetting to buy flowers for your significant other or rushing to the gas station to buy a bottle of wine for your friend’s birthday. This template will make you look like the best friend/spouse anyone could have. The first thing you need to do is follow the link provided for you at the bottom of this page. Each month of the year is listed out for you, making the template very intuitive to use. Start by finding the first month where you have a friend’s birthday or anniversary. The next step is to actually enter this information within the table on the lines provided. Begin this process by stating whether the event is an anniversary or a birthday. You can do this by checking one of the boxes to indicate which one. The next step is to enter the name of the person, under the “Name” column. Finally, just enter the day of the month this event takes place in the “Day” column. When you need to know when your friend’s are celebrating these major occasions, just open up your trusty Birthdays and Anniversaries Calendar, find the current month, and scan through your list of items. No more last minute shopping, go out and plan these gifts with the thought and commitment they deserve.